The newest addition to the Rockland/Camden area, located on Route One in Thomaston just a stones throw to Rockland. Rockland is the home of the Fantastic Atlantic Blues and Maine Lobster Festivals. The hotel features 85 guest rooms and studio suites with Hampton's exclusive Cloud Nine Beds, refrigerator/microwave, High Speed Internet, premium TV stations, indoor pool with whirlpool tub, 24 hour Business Center, complimentary ''On The House Hot Breakfast'', exercise facility, two meeting rooms, Suite Shop with microwave dinner entrees and on-site guest laundry. Choose two queen beds, one king bed (Jacuzzi available), or king studio suite with wet bar and sofa sleeper for your stay. We are located just two miles from Rockland Downtown and beautiful Harbor, two and a half miles from the Rockland Ferry Terminal and two miles from famous Camden Village and picturesque Harbor. Visit the world acclaimed Farnsworth Art Museum and Wyeth Center or Owls Head Transportation Museum. Sail aboard a historic Maine Windjammer. Hike in the serene Camden Hills State Park. Kayak the gorgeous Coast of Maine on Penobscot Bay. Above all, we are dedicated to our 100% Hampton Satisfaction Guarantee. Your complete satisfaction is our top priority! 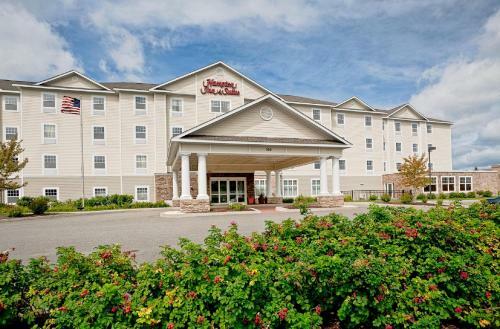 the hotel Hampton Inn & Suites Rockland so we can give you detailed rates for the rooms in the desired period.